Winner Winner…maybe a Chicken Dinner? Congratulations to Lillie McPherson being the winner of 12 Inches of Cast Iron from Lodge! She’s also bringing home an autographed copy of Robb’s new book- Wired to Eat along with an autographed copy of our newest cookbook- Weeknight Paleo! Lillie posted a comment on the blog about her favorite recipe our Paleo Sloppy Joes being one of her favorite recipes of ours. Thanks Lillie for your immense support and continued success in health and the kitchen! Throw a few pictures up on the blog or social media when you get everything in the mail. I turned to Paleo when I was steadily gaining weight with no explanation. Soon after I found out I had hypothyroidism. Since then I’ve been extremely interested in how diet can heal conditions like this. I think I’ll make Nom Nom Paleo Michelle Tam’s new recipe for wonton meatballs. Besides her InstantPot, I see her cast iron skillet the most! Congrats again to Lillie and to our boy Robb Wolf on the official release of his book today. On this episode: the most and least addictive foods; the “ingredients” that don’t make it onto the label; sauna bathing increases lifespan for men; time in the sun prevents diabetes. Also, we touch on some rewilding. There’s a Moment of Paleo segment about simplicity in food. After the Bell features an excellent TED Talk about Biomimicry. Vitamin D Lowers Colon Cancer Risk: What Can't The Sunshine Vitamin Help? TX Bar Organics – Grass fed & Grass finished Beef – Use Coupon Code “latestinpaleo” to save 10% on all orders! Hey Folks! So we don’t have a new podcast this week, but I thought I would give you a big list of all the podcasts I’ve been a guest on recently for the new book Wired to Eat. Thanks to all of the podcast hosts that have had me on. Enjoy! If you haven’t already, check out the new book Wired to Eat. On this episode: a Paleo book is recalled because of potentially dangerous recipes; Dr. Dean Ornish slams high animal protein diets in a NY Times Op-Ed; the alarming rate of new cases of myopia; from vacant lots to Shinrin Yoku. Plus, Plant Paleo, comedy from Dave Hemstad, sustainable sushi, a Moment of Paleo about tribal ties, trust, and loyalty; and David Suzuki After the Bell. Is Myopia The New Rickets? Are Schools To Blame? On this episode: a book & documentary recommendation; promoting brain health; illegally thin runway models; Blue Zones; and a new look at chronic cardio. Plus, a Listener Letter about “the dieting mind;” and an After the Bell segment featuring David Epstein. VEGETABLE PHARM : Humans are Not Broken…Plant Paleo. On this episode, we are joined by Stephan Guyenet. He is a former obesity researcher who holds a Ph.D. in neurobiology as well as a degree in biochemistry. He is the host of the popular blog, Whole Health Source. We talk about hunter-gatherer populations, the history of food and disease in America, whether legumes are Paleo, how much meat should be in our diets, and also the Ideal Weight Program that he helped to create. After the Bell it’s Dan Buettner on Living to 100. Latest in Paleo Facebook Page — Post Your Links or Just Say Hi! Whole Health Source: My TEDx Talk, "The American Diet: a Historical Perspective"
I was having a conversation with some of my co-workers, teammates, and training partners at Total Performance Sports last week. All of my training partners are multi-ply powerlifters that follow some type of Westside Barbell program. I am a raw powerlifter that is coached by Boris Sheiko. Boris Sheiko is known for his success as a powerlifting coach in Russia, accumulating over 40 gold medals in the sport. His programs are well known for the high total amounts of volume in the competition lifts and competition lift variations. One of the coaches was describing the differences in our training styles as being “totally opposites” of one another. At the surface it would seem that this is true, but when you dive a little deeper, each training method has a lot of similarities. This can be said about any successful training program. The big word that gets thrown around out there is periodization. There are three “big” types of periodization that are often discussed in personal training and exercise science textbooks. These three are linear, daily undulated periodization (DUP), and conjugate. Linear periodization is increasing intensity and/or volume of a specific exercise from week to week. Exercise selection would not change. An example would be if we squat on Monday, bench on Wednesday, and Deadlift on Friday. Week 1 we perform 3 sets of 5 at 80% of 1RM for all three lifts. Week 2 we would either increase the sets, reps, or the training intensity. This would be difficult to follow over the long haul as fatigue will accumulate quickly, as well as the risk of injury due to adaptive resistance to training the same movement patterns day in and day out. This is why early specialization in sports is fought so hard against by those coaches in the field. If we constantly perform the same patterns over and over we are more prone to overuse injuries within those patterns. I have never seen a true linear program because it is near impossible to do. DUP attempts to address the issue of not being able to continuously increase volume and intensity by alternating higher volume and lower volume days, or higher intensity and lower intensity days. This is important to utilize if you train each lift more than one time per week. Attempting to progress in a linear fashion from day to day would be extremely difficult, even for a beginner. A conjugate program, like a linear program, does not exist on its own without other elements. This would be constantly changing exercise selection to continuously provide new stressors to the body. However, if we ever repeated the same exercise twice we would need to use the same intensity, sets, and reps for it not to possess the other programming elements. Westside is often referred to as a conjugate program. In a typical Westside program there is a max effort lower day, max effort upper, dynamic effort lower, and dynamic effort upper. Max effort days you work up to a max single with the variation being used that day and dynamic effort is referred to as speed work. Volume on dynamic effort days will be higher with intensity dropping to 60% to 75% of 1 RM. This alone brings a DUP element into the training since volume and intensity changes within the week. They may use the same variation for a 3 week period as well. Each max effort day they will attempt to beat the previous week’s best. The dynamic effort days will increase in intensity over this period as well. This right here brings a linear element into the program from week to week. All 3 of these elements also exist within my programs from Sheiko, there just may be a little bit more variability to it. Sometimes my exercises progress from week to week for the linear element. I may perform squats at 75% for 5 sets of 3 on week 1 and 80% for 5 sets of 2 on week 2. However, sometimes it will be linear from 4 week block to 4 week block. I may do 65% 5×5 squats on day 1 of week 1 of block 1 and 70% for 5 sets of 4 on day 1 of week 1 of block 2. Sometimes it will even be in the reverse order where 70% for 5 sets of 4 will be performed first and later in the training block or in the next block in the same spot I will perform the 65% for 5 sets of 5 with chains. There is an example of conjugate in my blocks. Sheiko uses a lot of variations, so conjugate elements can be found day to day. I also tend to have one light day and one heavier day for each lift. The light day is technique work and the heavier day utilizes the competition lift with weight of at least 80%. This is very similar to the Westside split of max effort and dynamic effort. The only difference is I do not work up to a max as technique is very important to Sheiko and my lighter days are on the upper end of the dynamic effort range. When we throw bands and chains on exercises it tends to be a bit higher. Overall intensity for the week is probably very similar. All good programs contain elements of all 3 types of periodization elements. How much of each they contain may vary, but ultimately they contain them all. As a meet gets closer my conjugate elements will go away to focus more on the competition lifts and after the meet, when the next meet is far off, the conjugate elements will increase. So competition schedule will affect how many elements of each is utilized. If you are a strength athlete, look at your current program and see if all 3 of these elements can be found in it. If not, I would suggest finding a new coach. A program missing linear elements, will be missing out on the overload principle, without undulating your training it will be difficult to train each lift more than once per week and success will stall due to fatigue, and missing conjugate elements can lead to the athlete getting bored and injury due to pattern overuse and adaptive resistance. Before you go to the interwebs to trash other programs, understand that they are not that different from yours. Coaches and athletes tend to agree on 99% of all things training related, but will wage wars over the 1%. 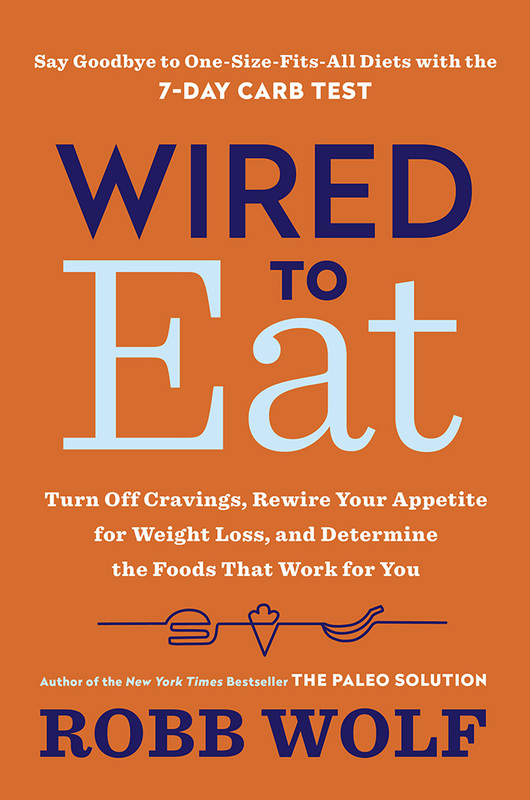 Today is the day, my new book Wired to Eat has officially released! 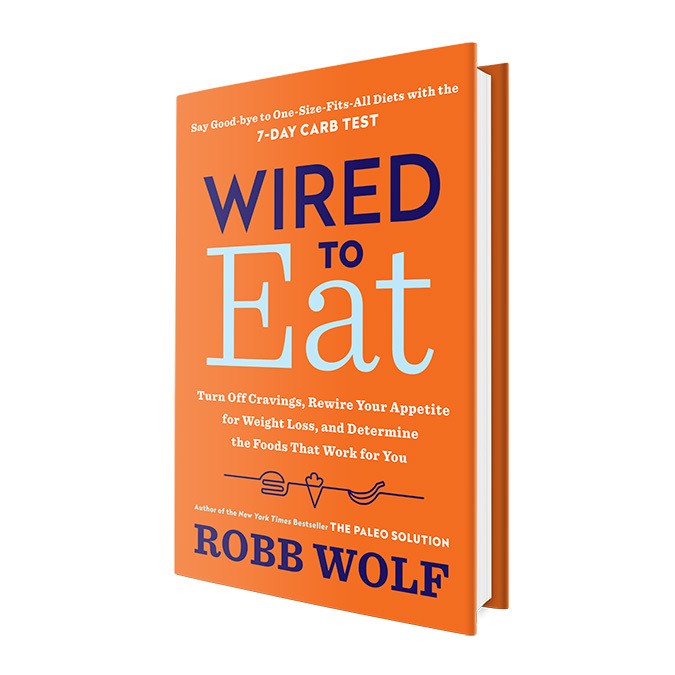 On this special episode my incredible wife Nicki Violetti joins me to talk about Wired to Eat, the 7-day carb test, and more Q&A about the book. Rendered lard is a tasty and traditional cooking fat. Whether you’re frying up eggs or roasting vegetables, lard is a higher temperature cooking fat and adds flavor to a variety of dishes. The key to rendering lard is to be patient and cook at a lower temperature to achieve that savory flavor. Chop the fat into 1/2-inch cubes. For easier chopping, place the fat in the freezer for 1 hour prior to chopping. To the slow cooker, add the water and cubed pork fat. Cook on the lowest setting, stirring the fat every 30 minutes. When the fat turns slightly brown, the lard is ready to be strained, generally between 2–4 hours of cook time, depending on your slow-cooker. Place a colander inside a large bowl. Line the colander with cheesecloth. Pour the rendered fat and leftover pieces into the colander slowly and carefully. Remove the colander. Pour the rendered lard from the bowl into a glass jar and store in the refrigerator. The post Homemade Slow-Cooker Rendered Lard appeared first on Paleo Magazine. In my generation, most young boys and girls have experienced an awakening upon our arrival to adulthood. Most of us did not become firefighters, actors, comedians, or world explorers, but instead dove directly into the professional world, crossing our fingers, and praying we listened to the right people. At twenty-four years old, the reality of ‘Adult’ing’ was unveiled to me as 9-10 hours of seated task work, constant problem solving, multi-tasking, 1 hour of exercise (big maybe), followed by endless multi-tasking. Factor in 50 (or more) TV/radio/web advertisements, synthetic food occupying my imagination, and an ample dose of blue light, it’s easy to see that being an adult is more about survival than enjoyment. Many people reach for the nearest gym as a solution. Some watch the news to find the best diet, but those solutions are all but guaranteed misses if we continue this trend of massive stress overload. Vast amounts of research compiled over the last two centuries have provided us with reason to believe that a lifestyle filled with chronic stress is at least partially responsible for many modern chronic diseases and dysfunctions. Men are reporting low testosterone at younger and younger ages, while the average age for menopause is slowly getting lower. This phenomenon of metabolic dysfunction is believed to be responsible for many of the health problems we deal with in today’s world. I have actually used the term ‘adrenal fatigue’ in the past since it simply resonated well with people and is pretty ear friendly. It had the word ‘adrenal’ which accurately targeted an anatomical point of interest and ‘fatigue’ which accurately described a symptom which a person feels after years of chronic stress. There is a major flaw in this term however. Using this term with patients, clients, or peers ineffectively communicates the vastly complicated nature and individuality of each case. Traditionally, if you had your serum cortisol or free cortisol tested, and it was below reference range, you would told you have some degree of Adrenal Fatigue. This misappropriation oversimplifies the problem. Example: The fitness world attempted to fix back problems by stretching hip flexors would fix chronic sitting. The assumption was that sitting created ‘shortened’ hip flexors, preventing full hip extension when standing and forces the lower back to hyper extend to compensate. This wasn’t completely wrong, as chronic sitting does typically result in poor standing/walking mechanics, but it’s not because the hip flexors became short. You may be thinking; what’s the difference? The end result is the same.’ But it’s not. That misappropriation led to ineffective strategies. The presumption that muscles eventually become ‘shortened’ resulted in many (sometimes under a fitness coaches watch) wrenching themselves into hip extending stretches to ‘lengthen’ the shortened muscle and banking on a positive result. In reality, tight muscles are not ‘shortened at all.’ They are a result of a mechanistic problem created when the nervous system memorizes positioning, breathing patterns, bone and muscle density requirements for the bulk of your life’s work – sitting. In essence, your body begins to ‘prefer’ or ‘adapt’ to the seated position. It’s a much broader picture and simply letting your 250lb man-child of a trainer wrench you into a stretch will rarely result in better active range of motion. Ultimately the best way to fix the problems caused by chronic sitting, is to avoid chronic sitting, practice better breathing patterns, and move around with more frequency and variance. How does this apply to adrenal fatigue? The same principles apply. The fatigue and symptoms associated with adrenal fatigue are actually a result of your adaption into undesirable state of overall metabolic function – not the fatiguing of one, albeit important, gland. This could be caused by a wide variety of factors, some are lifestyle related and some not. Associating this multitude of inputs with the term “adrenal fatigue” inevitably gives the impression that the solution lies in improving the function of the adrenals. This reductive approach is rarely an effective solution for chronic problems. Many factors such as alcohol use, infections, blood sugar imbalance, chronic inflammation, and emotional stress influence not only the adrenals but your detox capacity, muscle tissue quality, digestive tract, and more. Dysfunction in those systems cyclically affects each other as well. COMT is a gene which helps to break down neurotransmitters epinepherine, norepinephrine, and dopamine which are, in large part, responsible for igniting your almighty fight or flight stress response. When a stressful scenario has concluded, COMT comes right along and starts sweeping the floor of these sympathetic NT’s, making room for a much needed rest and relaxation. For some, that doesn’t come easily. Some researchers believe that up to 80% of people have some level of mutation in this gene, suggesting that most people do not effortlessly recover from stress. Research on COMT is providing a window as to why some people are crushed by the discomforts of crowded rooms and others seem to never ever burn out regardless of the circumstances. Some people, genetically are more prepared to recover from stressful situations than others. Hydrochloric Acid is responsible for breaking down proteins, kills unwanted bacteria, and helps to produce pepsin which also assists in breaking down proteins. Stress naturally decreases the amount of HCL produced in the gut, since stopping for chow won’t be necessary during a boxing match or if and when you need to escape a dangerous situation. Chronically low levels of HCL ultimately means that foods you consume do not get broken down in the gut effectively and can lead to nutrient deficiency or other consequences of malnutrition. With High-Intensity-Training still raging as the most popular training method, more people are busting their butts in the gym with fury. Some community based training facilities encourage training 6 days a week of high intensity interval based weightlifting. Without ample time dedicated to flushing the chemical stress response from training and recover from the catabolic nature of training, exercise can tear down a body faster than it can rebuild. Although movement and intense activity is a tremendous help to optimizing HPA Axis function, high levels of intensity in training must be coupled with active recovery methods both mentally (alpha states) and physically (joint mobility, massage, float tank). Overdriving exercise alone can cause stress maladaptation in individuals who do not recover well from stress or do not take the time to address joint inflammation incurred through weightlifting. HPA Axis Dysfunction: this term is a little more descriptive as it describes a maladaptation of the entire Hypothalamus-Pituitary-Adrenal Axis. From the brain down to the adrenals there are a plethora of ways an individual can over or under produce hormones inside of this chain, resulting in poor output of the adrenals. This system however will find the most efficient way to respond to the inputs you give it. Stress Maladaptation: Your body has simply adapted to the stressors. Remove or manage those stressors and your body will adapt accordingly. Finding hidden stressors is not a simple task, but this term more accurately describes the situation. This is also more ear friendly for clients and patients. It directly states that they are experiencing an adaption to negative inputs and not the fatiguing of a gland. There is still plenty of evidence that regularly committing to 7-9 hrs of sleep, a diet absent of processed oils/artificial sweeteners/processed sugars & starch, intelligent movement practice, and a variety of mentally stimulating tasks can improve the entire HPA Axis. Our bodies are great compensators, and metabolic functions are very expensive. Wherever we can afford to slow functions down to preserve energy or allocate it somewhere else. Rather than communicating that some gland gets sleepy because of a high workload, think of it as your body just borrowing currency and allocating it elsewhere. Eventually over time, your HPA Axis will essentially learn, or prefer functions which meet the demands of your life which may not be in-line with optimal function or health. Acute (sometimes underlying) infections can also affect your HPA Axis function. Some people can adapt well, others not. But the good news is, if you’re alive, you’re still adaptive.